Richard P. Feynman was Tolman Professor of Physics at the California Institute of Technology (1951-1988). Other institutional affiliations included Cornell University and Los Alamos Laboratory (Manhattan Project). His research interests included beta decay and field theory. May 11, 1918Birth, New York (N.Y.). 1939Obtained BS, Massachusetts Institute of Technology (MIT), Cambridge (Mass.). 1941 – 1943Physicist, Isotron Development Project, Princeton University. 1942Obtained PhD in Theoretical Physics, Princeton University, Princeton (N.J.). 1943 – 1945Leader, Diffusion Problems Group, Los Alamos Laboratory, Manhattan Project. 1945 – 1951Associate Professor of Physics, Cornell University, Ithaca (N.Y.). 1951Visiting Scientist, Brazilian Center for Physics Research. 1951 – 1988Tolman Professor of Physics, California Institute of Technology, Pasadena (Calif.). 1965Awarded Nobel Prize in Physics with Sin-Itiro Tomonaga and Julian Schwinger "for their fundamental work in quantum electrodynamics, with deep-ploughing consequences for the physics of elementary particles". 1979Awarded National Medal of Science. February 15, 1988Death, Los Angeles (Calif.). Advised by Feynman at California Institute of Technology, Stability and dynamics of spherically symmetric masses in general relativity. Advised by Feynman at California Institute of Technology, "The Growth of Water Waves Due to the Action of the Wind." Awarded the 1965 Nobel Prize in Physics along with Sin-Itiro Tomonaga "for their fundamental work in quantum electrodynamics, with deep-ploughing consequences for the physics of elementary particles." Research Assistant to Feynman at California Institute of Technology. Ph.D. advisor at Princeton University. Both employed at Princeton University. Advised by Feynman at California Institute of Technology on two topics in Elementary Particle Physics, and both employed at California Institute of Technology. Both employed at Cornell University and California Institute of Technology. Both employed at Los Alamos Laboratory, the Manhattan Project and Cornell University. Both employed at Princeton University and Cornell University. Leader, Diffusion Problems Group, Manhattan Project. Leader, Diffusion Problems Group, Los Alamos Laboratory. Obtained PhD in Theoretical Physics (1942). Physicist, Isotrom Development Project. "A Family Gathering": Letters to John A. Wheeler, 1977. A symposium in honor of Hans A. Bethe on the occasion of his 60th birthday [sound recording] at Cornell University, 1966 October 21. Elementary particles and the laws of physics : the 1986 Dirac memorial lectures / Richard P. Feynman and Steven Weinberg ; lecture notes compiled by Richard MacKenzie and Paul Doust. Lectures on gravitation, 1962-1963 / R. P. Feynman. Lectures on quantum electrodynamics [videorecording] : The Sir Douglas Robb lectures, 1979. Reminiscences of Los Alamos [sound recording] : a lecture series at the University of California, Santa Barbara, 1975. Reminiscences of wartime Los Alamos [sound recording], 1975. Richard P. Feynman lectures on physics [sound recordings], 1961-1964. The character of physical law [motion picture] / by Richard Feynman ; filmed by BBC TV ; producer, Alan Sleath. A new approach to quantum electrodynamics, 1949 Notes on the lectures of Dr. Richard P. Feynman, Cornell University. Albert R. Hibbs papers, 1884-2009 (bulk 1931-1999). David Allen Park collection of lectures and lecture notes, 1940-1952. Elmer and Joseph Heller collection on Richard P. Feynman, 1935-1990. Ernest Donald Klema response to 1981 History of Nuclear Physics Survey, circa 1983. Feynman's lost lecture : the motion of planets around the sun / David L. Goodstein and Judith R. Goodstein. Fritz Rohrlich notes from the Pocono Conference on Physics, 1948. Harold F. Webster notes, 1945-1953. Invited papers [sound recording] : American Physical Society Meeting, 1966 April 28. James C. Keck notebooks, 1946-1949. Julian S. Schwinger papers, 1920-1994. Oral History interview with David Goodstein, 2002. Oral history interview with Don Page, 1988 May 18. Oral history interview with Joseph H. Heller, 2010 May 5. Oral History interview with Petr Vogel, 2002 December 16 and 2003 January 16. Oral history interview with Steven C. Frautschi, 2003 June 17 and 20. Oral history interview with Valentine L. Telegdi, 2008 March 4 and 9. Oral history interview with Vera C. Rubin, 1995 September 21 and May 9, 1996. Progress: Autobiography of Joseph S. Levinger, 2010. Richard P. Feynman lectures and presentations, 1964-1992 (bulk 1979-1992) [videorecording]. Richard P. Feynman videotapes [videorecording]. Roger Edge Clapp papers, 1914-1991 (bulk 1940-1991). Classic Feynman : all the adventures of a curious character / Richard P. Feynman ; edited by Ralph Leighton. Feynman lectures on gravitation / Richard P. Feynman, [based on notes by] Fernando B. Morinigo, William G. Wagner ; edited by Brian Hatfield ; with a foreword by John Preskill and Kip S. Thorne. Photon-hadron interactions / [by] R. P. Feynman. QED : the strange theory of light and matter / Richard Feynman. Quantum electrodynamics; a lecture note and reprint volume. Notes corr. by E.R. Huggins [and] H.T. Yura. Quantum mechanics and path integrals / [by] R.P. Feynman [and] A.R. Hibbs. 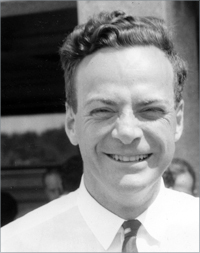 Selected papers of Richard Feynman : with commentary / editor, Laurie M. Brown. Six easy pieces : essentials of physics, explained by its most brilliant teacher / Richard P. Feynman ; originally prepared for publication by Robert B. Leighton and Matthew Sands; new introduction by Paul Davies. Six not-so-easy pieces : Einstein's relativity, symmetry, and space-time / Richard P. Feynman ; originally prepared for publication by Robert B. Leighton and Matthew Sands ; new introduction by Roger Penrose. Statistical mechanics; a set of lectures / [by] R. P. Feynman. Notes taken by R. Kikuchi and H. A. Feiveson. Edited by Jacob Shaham. The art of Richard P. Feynman : images by a curious character / compiled by Michelle Feynman. The character of physical law [by] Richard Feynman. The meaning of it all : thoughts of a citizen scientist / Richard P. Feynman. The pleasure of finding things out : the best short works of Richard P. Feynman / by Richard P. Feynman ; edited by Jeffrey Robbins ; foreword by Freeman Dyson. Some time with Feynman / Leonard Mlodinow. The principle of least action in quantum mechanics [microform]. The theory of fundamental processes / R.P. Feynman ; notes taken by P.A. Carruthers, M. Nauenberg ; notes corrected by H.T. Yura.